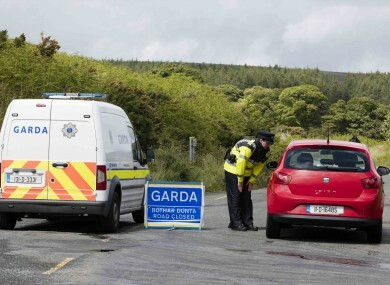 A garda at road block to the crime scene where part of a body was found by walkers on the Feartherbed Mountains on the Dublin Wicklow border. GARDAÍ IN BRAY investigating the discovery of human remains in the Wicklow Mountains have said that a post-mortem will determine the type of investigation to be carried out. Speaking to RTÉ News this evening, Superintendent Pat Ward of Bray Garda Station said that the force was committing significant resources into following up on the discovery. The discovery was made on Military Road, Enniskerry in the Wicklow Mountains by walkers around 7.45pm last night who immediately contacted Gardaí. The scene of the discovery is preserved for a Garda forensic examination and the office of the State Pathologist and the local Coroner has been notified. A post-mortem is due to be carried out on the remains. It’s similar to a murder investigation,” Ward told reporters. “The type of investigation we are undertaking is comparable to a murder investigation, we’re putting as much resources and effort into it as if it was a murder investigation. But the type of investigation that we undertake from now will be determined by the result of the post-mortem examination. The remains have yet to be identified and enquiries are ongoing. Searches at the site are continuing. Investigating Gardaí are appealing for any person who may have seen anything suspicious in the area or who may have information in relation to this investigation to contact Bray Garda Station on 01-666 5300, the Garda Confidential Line 1800 -666- 111 or any Garda Station. Email “Post-mortem results will determine nature of investigation into human remains found on Wicklow Mountains”. Feedback on “Post-mortem results will determine nature of investigation into human remains found on Wicklow Mountains”.